The Pumpkin Pummeler is a Limited Edition Shadow type weapon that can be upgraded to the Cackle Lantern Trap. It takes one seriously evil pumpkin seed to grow a squash so steeped in malevolence, so genuinely nasty that it will sacrifice its brothers and sisters on the vine to smash random passersby... but hey, it makes a great trap mechanism. Mice come in, expecting a festive treat, (and maybe a guy dressed up as a scarecrow jumping out of the bushes), and instead, they come face to face with a real Halloween horror, complete with monster teeth! 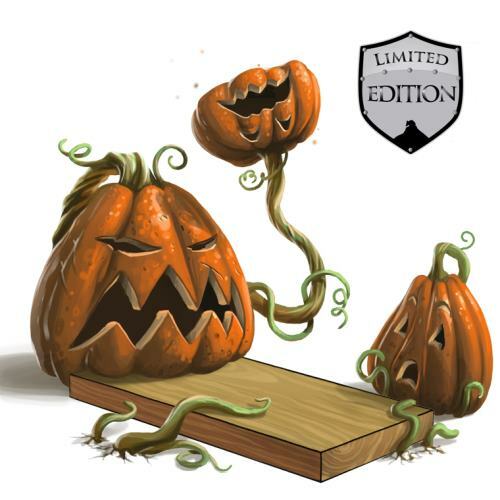 The Pumpkin Pummeler is a Limited Edition weapon and can no longer be acquired by Hunters. It was not sold by any Trapsmith. It can only be crafted given the proper ingredients. The Pumpkin Pummeler (if unintentionally smashed) can be reassembled from Smashed Pumpkin. Cackle Lantern Trap - Requires the Smashed Pumpkin for crafting. Smashing this weapon with the Hunter's Hammer yields the Smashed Pumpkin. 20 October 2010: The Pumpkin Pummeler trap was introduced as part of the Halloween Trick AND Treat event.